These are an entry-level road shoe that deliver optimum performance. 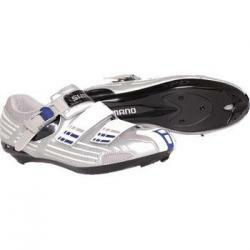 They have a large nylon mesh uppers area which provides high breathability and a micro-adjustable buckle top strap system with two asymmetrical straps which alleviate pressure points and create a secure, stable and comfortable pedaling platform. They also have a Fibreglass reinforced nylon outer sole. They have an average weight of 564g.